2019 is off to an excellent start at Royal New York! Check our some of our traders’ current favorite coffees below. This offering from Peru comes from a group of 100 women who joined together to create the program called “Las Damas de San Ignacio”, also known as “the Ladies from San Ignacio”. This coffee is my favorite because it’s approachable, sweet, bright and memorable. You can roast it multiple ways to bring out different levels of sweetness, chocolate, and acidity. It’s a great single origin that can be highlighted as drip, espresso or cold brew (as a nitro cold brew it tastes like a yoohoo!). You can’t go wrong with this one, I highly recommend it to anyone looking to bring in a comforting coffee during the harsh winter months. Huila is well known in the specialty market for producing some of the best-washed coffees in the world and this delivery from Alcides Sanchez’s La Troja Estate is a perfect example. The notes of peach and green apple contrast with the smooth milk chocolate aftertaste deliver a balanced, complex and interesting cup that will have your customers asking for more. Great coffee at a great price! Traditional washed East African profile with notes of sweet tea, ripe peach and honey at a roast level on the lighter side of Medium. 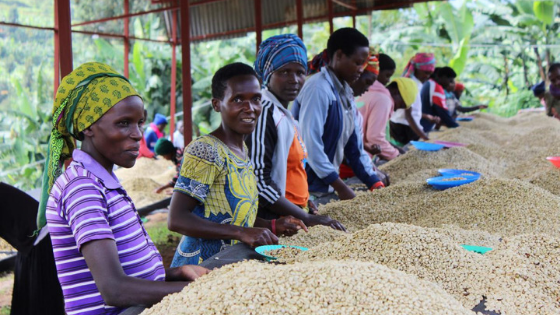 Peaberrys from Rwanda are viewed as a byproduct unlike it’s Tanzanian neighbor making this coffee a great values for the cup score. My favorite right now is the Colombia Aponte Nariño-Royal Reserva Honey(GP). This one jumped off the cupping table for me. I really appreciated the sweetness and balanced acidity this honey processed coffee had. Cupping notes of red apple, cherry, white sugar, and strawberry jam. Plenty of bags in store! This is a new one for us, but the folks at the Teka washing station absolutely delivered on this coffee. Careful attention to processing and drying gives this coffee a super clean final cup with notes of red grapefruit, peach, and sweet tea. It’s sweet, but there’s a really pleasant tart flavor present too. Definitely something to consider for a Chemex or other pour over. Papua New Guinea is an origin that has consistently been a favorite of mine throughout the years mainly due to the complexity in the cup and storytelling ability for the coffees that we have been fortunate to source. In Papua New Guinea a majority of the coffees are washed (compared to some of the neighboring islands) which can produce a much sweeter and cleaner cup profile. This year, we were able to work with a tribal group called Tsekaka that owns and operates a plantation called Amuliba in the Jiwaka Province in the north east of PNG. They were able to sort a full container of peaberries for us that are very clean and cup with sweet fruit notes of cherry and cantaloupe.